For the first time, it is possible to mass-produce an exterior car part featuring a honeycomb sandwich structure with a class-A film, with the polyurethane foam system Elastoflex® E from BASF. 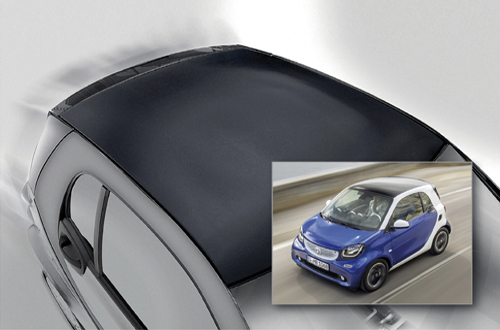 The roof module in the standard model of the new Smart Fortwo consists of a paper honeycomb and two surrounding glass fiber mats. These are sprayed in an impregnation process with the low-density, thermally activable Elastoflex® E 3532 and pressed together with a solid-colored class-A film. A single operation thus produces a roof module which is around 30 percent lighter than the standard roof on the previous model – but retains the same strength and flexural rigidity. The lightweight roof was developed by Fehrer Composite Components, which manufactures it in its factory in Großlangheim, Germany. The reactivity of Elastoflex® E has been adjusted so that long spray times of up to 120 seconds are possible for large-scale parts, along with short demolding times of up to 60 seconds. Moreover, decorative materials and films can be directly bonded or back-foamed in the mold as Elastoflex® E shows good adhesion to films. The roof module of the Smart Fortwo is fitted on the outside with a film having a class-A surface. A textile covering is attached on the inside. “In contrast to conventional composite parts, in this roof module the individual layers are not glued together in a multi-stage process, but are instead produced in a single manufacturing step. This is much more efficient – also thanks to the clean process with the polyurethane foam and the customized technical support from BASF,” says Gao Kwintmeyer, Global Purchasing Fehrer.